Chocolate Audio release Drum Particles with $100 off ! 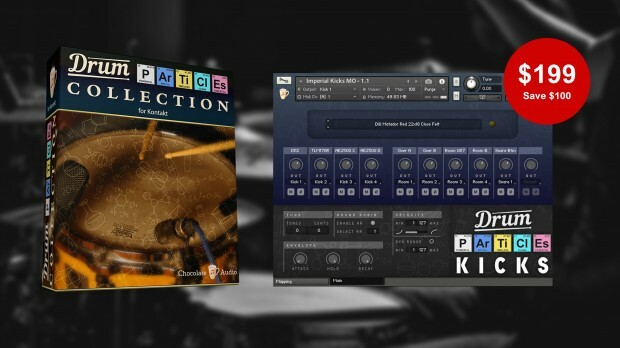 Chocolate Audio proudly release Drum Particles, a collection of widely sought after drum instruments for Native Instruments Kontakt. Available now for $100 off! Only $199 until February 28th, 2019. Formally known as Drum Single Collection, Particles adds Chocolate Audio’s Imperial Drums to the mix and new features, culminating in 48 GB’s of data and 300 drum pieces. Everything is here for all your drum needs, Ludwig, Sonar, to Tama, Paiste, Zildjian and much more! Get Chcocolate Audio’s Drum Particles Here ! This entry was posted in DontCrack, Event, Promotions, Virtual Instruments and tagged Black Album, Chocolate Audio, Contemporary Vintage Drums, Cowbell, Drum particle, Drums, dw, Fingersnaps, Gretsch, Handclaps, Imperial Drums, Ludwig, Mallets, Metallica, Modern Retro Drums, Paiste, Pearl, Premier, Sabian, Sonar, Tama Starclassic, Tambourine, The Black Album Drums, Turkish, Ufip, Vistalite, Yamaha, Zildjian. Bookmark the permalink.